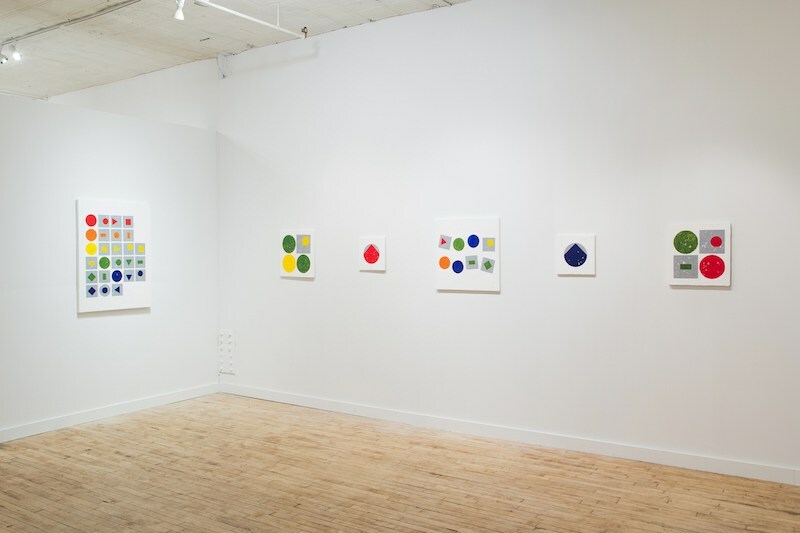 Contributed by Jonathan Stevenson / Given the demonstrated capability, energy, and ambition of Bushwick artist, gallerist, and all-purpose cultural maven Paul D’Agostino, that he would invent his own visual alphabet – as he has for his new show of paintings “Scriptive Formalities” at Life on Mars – isn’t surprising. A Ph.D. in Italian literature and instructor at Parsons as well as a veteran translator and visual artist, he has been showcasing a deft curatorial fusion of intellectual depth and aesthetic perspicacity for years at his own gallery Centotto around the corner on Moore Street. D’Agostino’s 2013 solo show “Twilit Ensembles,” at Pocket Utopia on the Lower East Side, blended playfully mythic verbal narrative with otherworldly imagery; it was a uniquely satisfying integration of multi-disciplinary approaches and restless imagination. In his new show, he meets the high expectations he has set for himself. 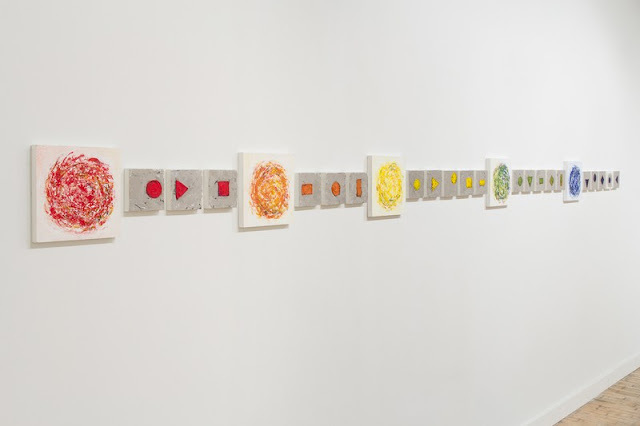 D’Agostino lays out the alphabet in 26 oil-and-acrylic panels on a wall near the entrance – the vowels big, roiling circles of primary and secondary colors, the consonants small, calm shapes of the same colors. This dispensation may lull viewers into thinking the exhibition might be a facile exercise in basic encryption or semaphore signaling as geometric abstraction. They’d be wrong. Instead, he proceeds to compose pictorial words that correspond not only to English but also other languages, and to the sounds that emerge when they are spoken. The German umlaut, since it represents the blending of vowel sounds, is signified by bisecting the circles into two different colored halves; a circumflex by centrally positioning a different colored arc segment at the top of the vowel circles; grave and acute accents by positioning such segments asymmetrically; the Scandinavian A-ring, as it stands for a double-A sound, by bisecting a red circle. The more complicated paintings depict artistically resonant words like “Zeit” and “couleurs.” Thus does D’Agostino pull off a kind of aesthetic alchemy by making paintings that involve letters, sounds, and words – potentially from the full range of languages – without deploying any traditional text whatsoever. He also observes that he might never have made any of these paintings were it not for the prescriptive system that he devised. Mel Bochner primarily wants to situate words and text within other contemporary visual “noise,” for which brushwork and typography work nicely. Viennese artist Florian Pumhösl makes spare, hypnotic paintings that are formally Minimalist, but unlike the typical Minimalist or hard-edge abstractionist he subtly invests his work with specific culture and history. D’Agostino, for his part, seems centrally interested in language writ large as a human artifact and action, for which painting methods reflecting contingency and the passage of time are more appropriate. So he augments his choice of color and shape in rendering his language with thickly painted surfaces that give his symbols a palpably earthy context. His putty-knife paint application generates a slashing, haphazard tackiness, dappled with pockmarks, which gives each piece a lived-with quality. The colors, including metallic silver, are highly saturated, straight-out-of-the-tube vibrant, and the craggy surfaces suggest layers of ornate plastering that have been overpainted with contemporary wayfinding iconography – strata suggesting an iterative evolution that might seduce an archeologist. His new paintings are a long way from the cagey underground-comix-meets-Italian-literature-scholarship sensibility manifested in “Twilit Ensembles,” to which he hearkens back with several later series of spookily whimsical captioned charcoal drawings in the gallery’s small project space. There Lady Skyecharmer of the Isle, a pterodactyl who bears the nerve-wracking burden of putative but false extinction, among others, join the Legendary Fish Monster and Herr Doktor Zweinzahne. But the new work is not completely disconnected from the old: Zweinzahne, as it happens, was an errant archeologist. Paul D’Agostino’s drawings in the Project Room at Life on Mars. If with those earlier inventions D’Agostino was exploring the capacity of ordinary language and representational drawing to articulate the exotic, now with his alphabet he seems to be showing how ostensible abstraction can both flow from and to worldly referents. The paintings stand firmly on their own as discrete objects, but, like any language, also establish a tool for discursive – indeed infinite – iterations of increasing complexity and sophistication. For all its layered richness, “Scriptive Formalities” may only be the beginning of a long investigation for D’Agostino. 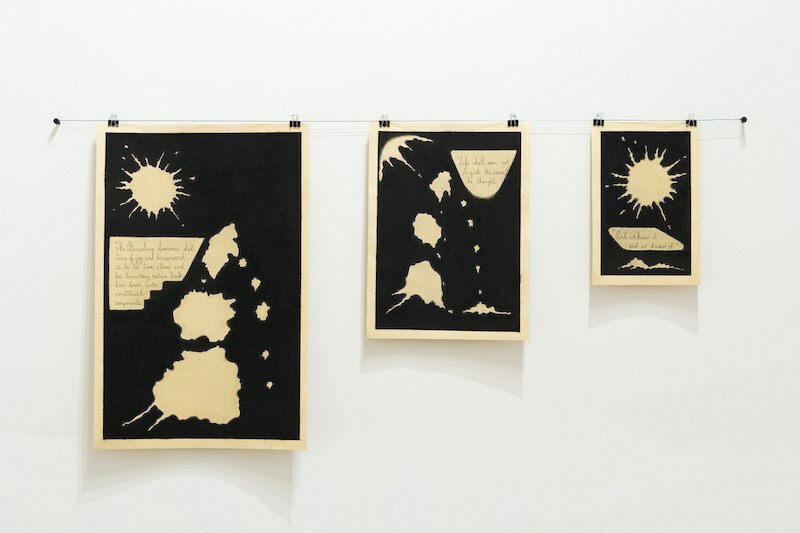 The show plants the suspicion, for instance, that he could extend his methodology to Russian or Turkish, Arabic or Farsi, or use it to construct a sustained pictorial narrative. 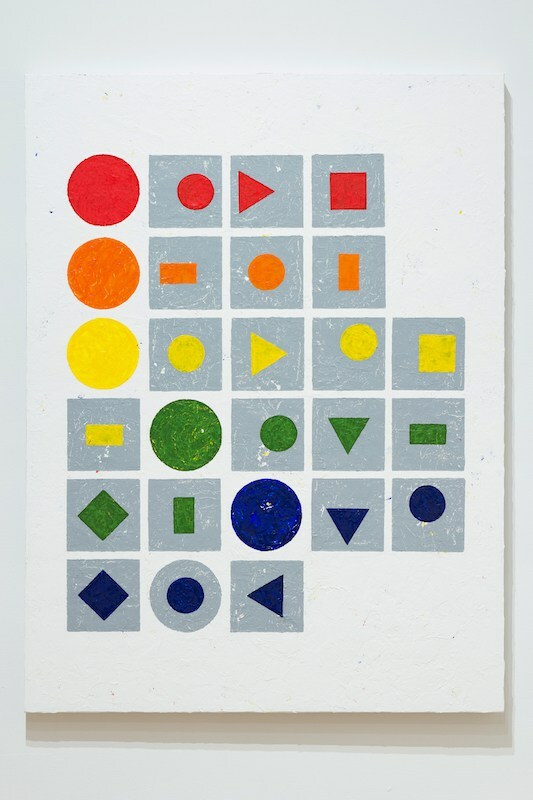 He also wonders whether his system’s correlation of letter, sound, symbol, and color might make it useful in art therapy or speech pathology, or in teaching young children, who love to learn how to read until it becomes tiresomely rote and to color seemingly without limitation, about language and translation. There is substantial visual wisdom on the walls of Life on Mars now, and probably more to come in the vein D’Agostino has so cleverly tapped.